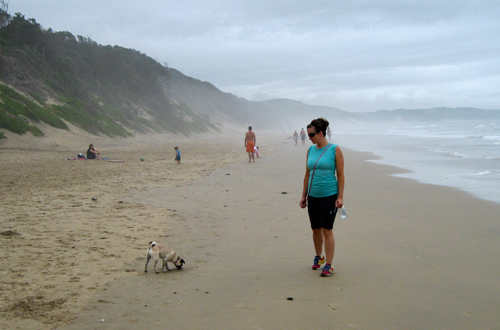 We headed out for our holiday road trip bright and early on Tuesday morning – which in Durban, means 4am. I don’t know why the sun rises so early here, but it’s absurd! Most people take advantage of the early light to get in some pre-work surfing; we simply bought a 2nd layer of curtains. Anyway, everyone we spoke to had advised us to get on the road at that ungodly hour so that we’d get through most of the small towns along the route before they got too clogged up with people in the roads. What’s that, you ask? Our planned route took us through an area known as the Transkei, which was designated as a “homeland” during apartheid (basically a province to which the white rule banished members of the Xhosa tribe). Though it was somewhat of an independent country for a while (according to the apartheid-era South African government, anyway, if not the United Nations), it was absorbed back into the Eastern Cape province in 1994 with the end of apartheid. All this is to say… the Transkei is REAL Africa. Much of the scenery is stunning: lush, green, rolling hills punctuated by rock outcroppings and sheer cliffs. But it’s also defined by grinding poverty, piles of garbage, free-grazing animals, and thousands of people standing or walking on or beside the highway. Between the wandering cows and the throngs of humans, it was – to say the least – an interesting drive. But just 7.5 hours after leaving Durban, we rolled into Cintsa Bay – towards the southern end of the Eastern Cape’s “Wild Coast”. 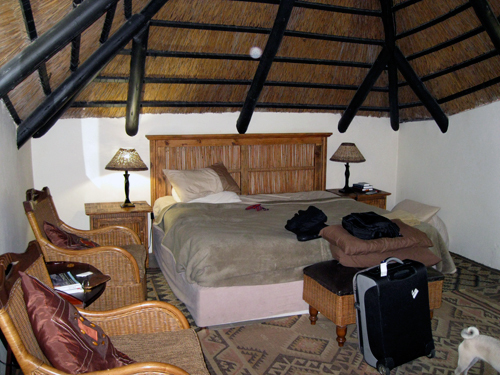 We were booked into a place called Crawford’s Cabins, which turned out to be a complex of gorgeous thatched huts built into a hillside sloping down to the stunning bay. Internet booking WIN! Crawford’s was AWESOME, family-owned and insanely dog-friendly. The on-site restaurant put on an elaborate buffet 3 times a day, and their bar whipped up a mean Pimm’s cocktail. Except for one venture into town for lunch on our second day, we never even left the grounds! The weather was pretty bleak for most of our stay. 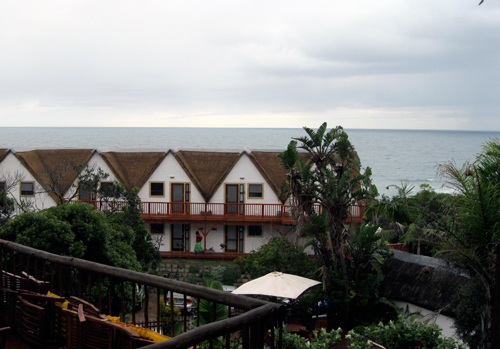 We got in one great, long beach walk before the rain started, but after that it was just cards and movies while listening to the rain on our thatched roof. Hey, we live at the beach, so it wasn’t disappointing in the least! A lovely, relaxing few days. Our room, which got ransacked by monkeys while we were at lunch. They ran off with our mixed nuts, banana chips, and all of the coffee bar's sugar packets. 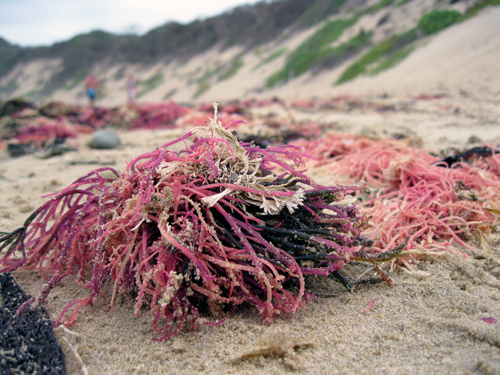 The beach was strewn with this pretty pink seaweedy stuff. It smelled slightly less pretty. Checkin' out the beach with Le Rox. Real-doggin' it up! 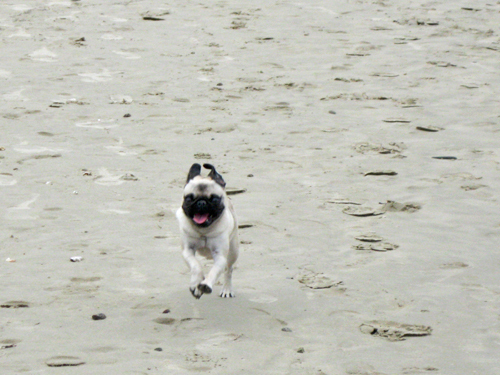 She had a blast on the trip - played (nicely) with dozens of other dogs, walked and ran and jumped and showed off. She's still sleeping, more than 48 hours after we got home. Love it! Roxy says a sad goodbye to her camp friends. 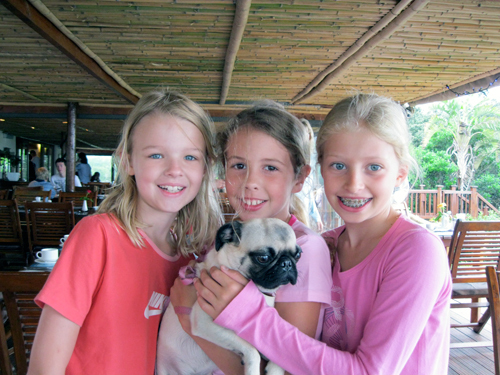 These girls LOVED that pug! John and I both thought that the one on the left looks like a girl version of our nephew Liam.